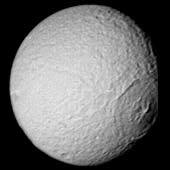 Tethys [TEE-this] was discovered by Giovanni Cassini in 1684. 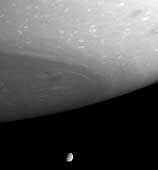 It is an icy body similar in nature to Dione and Rhea. The density of Tethys is 1.21 gm/cm3, indicating that it is composed almost entirely of water-ice. Tethys's icy surface is heavily cratered and contains cracks caused by faults in the ice. The terrain is composed of densely cratered regions with a lightly cratered, dark belt that extends across the satellite. 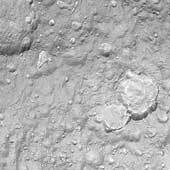 Light cratering indicates that Tethys was once internally active, causing parts of the older terrain to be resurfaced. The exact cause for the dark belt is unknown, but a possible interpretation comes from recent Galileo images of Jupiter's moons Ganymede and Callisto. Both satellites exhibit light polar caps that are made from bright ice deposits on pole-facing slopes of craters. From a distance the caps appear brighter due to a haze caused by thousands of unresolved ice patches in small craters. 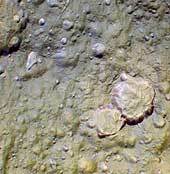 Tethys' surface may have been formed in a similar manner, consisting of hazy polar caps of unresolved bright ice patches with a darker zone in-between. Tethys has an enormous trench named Ithaca Chasma that is about 65 kilometers (40 miles) wide and several kilometers deep. 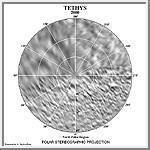 It covers three-fourths of Tethys' circumference. The fissure is about the size scientists would predict if Tethys were once fluid and its crust hardened before the interior. Another prominent feature is an enormous 400-kilometer impact basin named Odysseus. The impact scar spans more than two-fifths of the satellite with a diameter slightly larger than Saturn's moon Mimas. When Odysseus was first created, the crater must have been deep with a high mountainous rim and towering central peak. Over time the crater floor relaxed to the spherical shape of the Tethys's surface, and the crater's rim and central peak collapsed. 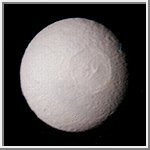 Tethys' surface temperature is -187° C (-305° F). This view of Tethys was taken by Voyager 2 on August 26, 1981 from a range of 282,000 kilometers (175,000 miles). It is the best complete image acquired by the Voyager spacecraft. An enormous trench named Ithaca Chasma extends from the left side of this image to the upper center. The fissure is about 65 kilometers (40 miles) wide, several kilometers deep, and extends across three-fourths of Tethys' circumference. This is the best color image of Tethys taken by the Voyager 1 spacecraft. It was produced by combining three images taken through orange, green and blue filters. The image on the right has been color and contrast enhanced in order to emphasize the dark belt that stretches across the satellite. The exact cause for the dark band is unknown, but a possible interpretation comes from recent Galileo images of Jupiter's moons Ganymede and Callisto. Both satellites exhibit light polar caps that are made from bright ice deposits on pole-facing slopes of craters. From a distance the caps appear brighter due to a haze caused by thousands of unresolved patches of ice in small craters. The dark band on Tethys may have been formed in a similar manner, consisting of hazy polar caps of unresolved bright ice patches with a dark zone in-between. The northern polar region of Saturn's moon Tethys seen in this Cassini flyby image is a ponderously ancient surface. Above the prominent peaked crater Telemachus are the remnants of a very old crater (at the 10 o'clock position relative to Telemachus) named Teiresias. The ancient impact site is so badly overprinted and eroded by impact weathering and degradation that all that remains is a circular pattern of hummocks that mark where the old crater rim existed. This view is centered on terrain at approximately 1.2 degrees south latitude and 342 degrees west longitude on Tethys. The view is rotated so that north is about 40 degrees to the right. This view is among the closest Cassini images of Tethys' icy surface taken during the Sept. 24, 2005 flyby. This image is a clear-filter view and is the highest resolution image acquired by Cassini during the encounter. The two large craters at the right show evidence that landslides have modified their outlines and covered their floors with large quantities of debris. Linear depressions cutting across the terrain probably mark the surface expressions of faults or fractures. For a false-color image see PIA07737. This view is centered on terrain at approximately 4.2 degrees south latitude and 357 degrees west longitude on Tethys. The image has been rotated so that north on Tethys is up. This false-color image, created with infrared, green and ultraviolet frames, reveals a wide variety of surface colors across this terrain. The presence of this variety at such small scales may indicate a mixture of different surface materials. Tethys was previously known to have color differences on its surface, especially on its trailing side, but this kind of color diversity is new to imaging scientists. For a clear-filter view of this terrain, see PIA07736. This view is centered on terrain at approximately 4.2 degrees south latitude and 357 degrees west longitude on Tethys. The view has been rotated so that north on Tethys is up. With this full-disk mosaic, Cassini presents the best view yet of the south pole of Saturn's moon Tethys. The giant rift Ithaca Chasma cuts across the disk. Much of the topography seen here, including that of Ithaca Chasma, has a soft, muted appearance. It is clearly very old and has been heavily bombarded by impacts over time. The moon's high southern latitudes, seen here at the bottom, were not imaged by NASA's Voyager spacecraft during their flybys of Tethys 25 years ago. The mosaic is composed of nine images taken during Cassini's close flyby of Tethys (1,071 kilometers, or 665 miles across) on Sept. 24, 2005, during which the spacecraft passed approximately 1,500 kilometers (930 miles) above the moon's surface. 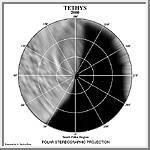 This view is centered on terrain at approximately 1.2 degrees south latitude and 342 degrees west longitude on Tethys. It has been rotated so that north is up. This image offers excellent contrast with a previously released view (see PIA06629) that showed the bright, wispy markings on Dione's trailing hemisphere. The huge impact structure Odysseus (450 kilometers, or 280 miles across) is near the limb of Tethys. Compared with the battered surface of Tethys, Dione appears much smoother from this distance. 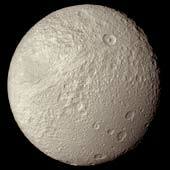 Early in the history of Tethys, an impact occurred forming an enormous 400-kilometer impact basin named Odysseus. 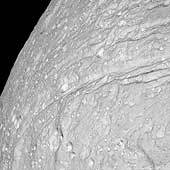 The impact scar spans more than two-fifths of the satellite with a diameter slightly larger than Saturn's moon Mimas. When Odysseus was first created, the crater must have been deep with a high mountainous rim and towering central peak. Over time the crater floor relaxed to the spherical shape of the Tethys' surface, and the crater's rim and central peak collapsed. (Similar relaxation is apparent on Jupiter's moons Callisto and Ganymede.) 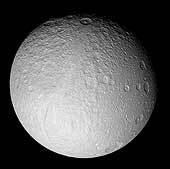 At the time of the Odysseus impact, Tethys must have been sufficiently warm and malleable to allow the topography to collapse. Tethys' interior may have even been liquid. If Tethys had been colder and more brittle at the time of impact, the moon may have been shattered. 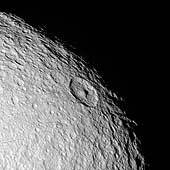 If it survived the impact, the topography of the crater would have retained its shape similar to Herschel crater on Mimas. Having now passed closer to Tethys than the Voyager 2 spacecraft, Cassini has returned the best-ever natural color view of this icy Saturnian moon. 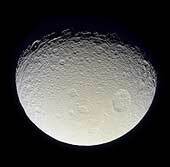 As seen here, the battered surface of Tethys (1,060 kilometers, or 659 miles across) has a neutral hue. The image here is a mosaic of two footprints. Three images taken in the red, green and blue filters were taken to form a natural color composite. The result reveals a world nearly saturated with craters - many small craters lie on top of older, larger ones, suggesting an ancient surface. At the top and along the boundary between day and night, the moon's terrain has a grooved appearance. This dazzling view looks beyond gigantic storms near Saturn's south pole to the small but clear disc of Tethys (1,060 kilometers, or 659 miles, across). Clouds and ribbons of gas swirl about in the planet's atmosphere in the foreground, while a tremendous chasm is visible on the icy moon. This image shows a nice profile view of the giant impact basin Odysseus (lower right-hand limb). Because Tethys was warmer when the impact occurred, the crater floor relaxed to the spherical shape of Tethys' surface, and the crater's rim and central peak collapsed. Towards the upper-right limb is a portion of the immense trench Ithaca Chasma.